Several years ago, I visited Finland with my mother and sister. We had a wonderful time staying with a past exchange student’s mother in the quaint countryside, eating traditional home-cooked meals, braving windy days, and strolling cobblestone streets. In our downtime, we were introduced to a traditional Finnish game called Mölkky (or, as I like to call it, The Finnish Log Game). The game is simple to play and we quickly became addicted to playing it every night of our stay. Towards the end of our trip, I made it my mission to purchase a version of it to bring back to the states. This game has followed me to every picnic, team outing, beach vacation, retreat, and BBQ I have attended in the last 3 years. It brings out the competitive streak in my most mild-mannered of friends and sometimes leaves us scratching our heads as to how a stick of wood can bounce around a pin mere centimeters away. This weekend I took my Finnish Log Game to a women’s retreat with the church Adam and I have been attending in Austin, and once again I found lots of people enjoying the game and wanting to play many times over. It reminded me to bring it out hibernation when I’m at home, because I love playing it so much. As with many games, I’m sure the rules I learned to play by are quite different that the original rules, but who cares when you’re having fun? Well, it’s that time of year again. Time for my annual year in review post. Let’s see what’s changed in my life in the past year, shall we? 2011: I’m sooo over drivers who drive slower than the posted speed. 10 in a 30 is not ok, but thanks for finally getting out of my way. 2012: I’m not adjusted to the CRAZY traffic in Austin. Between the rush hour parking lots and the folks who don’t know how to drive it’s annoying. 2012: Still obsessed. But as I was planning my wedding, I found out about Wedding Chicks and their free downloads. Ummmm….lifesaver! I used several of them to design my own paper details for our big day. 2011: I received an iPad for Christmas (Thanks, Adam!). I now drift off into dreamland playing Mahjong. 2012: I received a nice upgrade to my work computer this year. It’s made my life sooooo much better. Who knew Captivate could actually run without crashing? 2011: What [American Idol] season is it this year? 2012: Idol is old news. I’m counting down the weeks until the premiere of a new season of “So You Think You Can Dance”. 2011: Ellen never fails to make me laugh, then cry, then laugh again as I watch her talk show. 2011: Umm, “OMG” was just added to the Oxford Dictionary. I feel like everything I learned in English class was a lie. 2011: Does anyone else see something wrong with Jim and Alexis’ relationship or is it just me? So. Wrong. Give her a voice and get your own dang orange juice, puh-lease. 2012: Why can’t I convince Adam that the Real Housewives franchise is a legitimate television series? 2011: In a little over 6.5 months we will be married! And living in the same zipcode – yet to be determined. 2012: Our zipcode was determined. I became an inhabitant of Texas. Lesson? Never say never when love is involved. 2011: The iPad is the single greatest invention ever. It’s practically attached to my hip when I’m at home. Is there anything it can’t do? 2012: The App “Paper” is incredible, it’s literally like having an easel at your fingertips. 2011: In case you haven’t noticed, I’m obsessed with Jazzercise so much that it’s been mentioned on my blog at least 7 times. I will stop you in the street and tell you about it, if you’ll let me. LOVE. IT! 2012: Honestly? I haven’t been to a Jazzercise class since January. The traffic to the nearest studio is so crazy that my drive time is just as long as my class time, which ends up equalling around 2 hrs. Instead, I’ve found a new exercise regimen in Yoga. I’ve developed a bit of a home practice and on occasion Adam and I will catch a Vinyasa class at Black Swan downtown. 2011: Try as I might to not get sucked into the addiction that is Twitter, I’ve failed. And I sometimes clog my followers feeds with senseless live tweets for pageants, award shows and documentaries about ferrets. Truly sorry, y’all! 2011: The Social Network was the best movie of the last year hands down. I wonder how many of the applications and games Zuckerberg uses on his profile and if he’s one of those every 5 minute updaters? 2012: The Hunger Games was incredible and ended up being a great date night movie. Plus, it doesn’t hurt that we saw it at Alamo Drafthouse. I think any movie seen there ends up being incredible. 2011: Gelato for ZAZA makes me happy, especially Honey Yogurt. 2012: I long for ZAZA. At least once a week Adam and I crave their salads, but alas an 8 hour drive keeps us from giving into our craving. Of course, after I move they develop the gelato I suggested: Nutella. 2012: Who cares? Thanks to Netflix I’ve developed quite the interest in documentary films. Some of my favorites? The Cove and Bill Cunningham New York. I’m also looking forward to seeing Girl Model when it comes out. 2011: A day without Jazzercise most often leads to a less perky version of myself. Need. It. 2012: Well, I’ve had many days without Jazzercise and, while I think this is true to an extent, Yoga has helped me maintain a perky disposition. 2011: Still true, but I’m basking in my solo life since it will soon be coming to an end. Then I get to annoy Adam every. single. day. with my perkiness, random thoughts, and Bravo reality shows!! I know he’s excited. 2012: No longer single, but instead happily married and I’m living the dream as stated above. Life is wonderful! 2012: In just under 2 weeks we’ll be going to DISNEY WORLD!!! I looked high and low for a bag that in no way resembled a fanny pack for this trip. Lucky for me I found the perfect cross-body purse, it’s by pure coincidence that it’s green. 2011: Did I mention I’m getting MARRIED in October?!?! CAN. NOT. WAIT! 2012: October came and went with a wedding. A wonderful celebration with family and friends followed by a perfect honeymoon full of wine and relaxation. I’m so incredibly blessed! 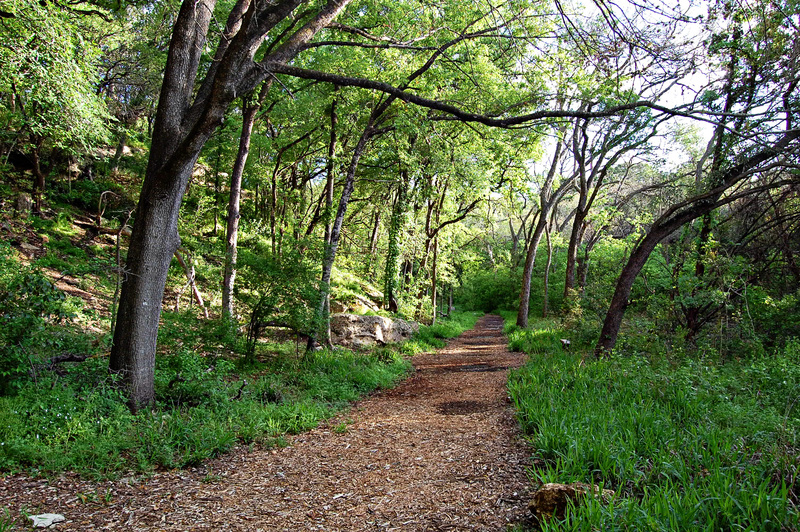 This past weekend, Adam and I stumbled upon the Mayfield Park and Preserve in Austin. It’s quite possible it’s Austin’s best kept secret..but now I’m letting the cat out of the bag. This place is incredible. 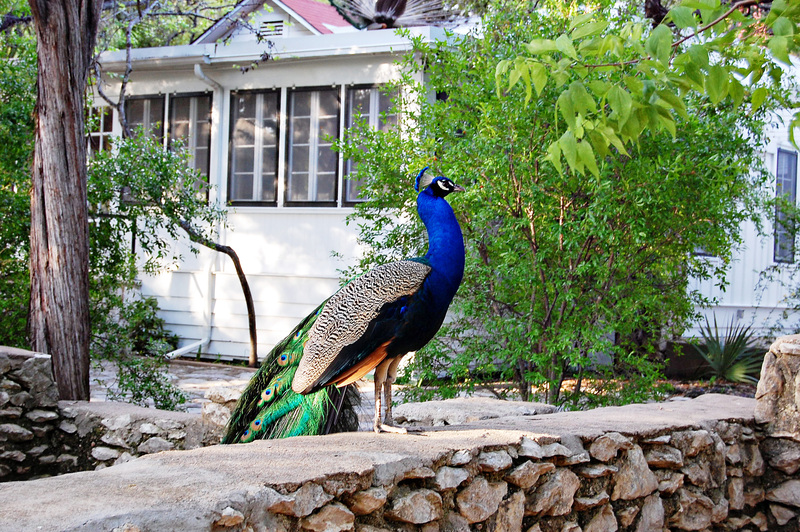 From its perfectly maintained gardens, to its free-roaming peacocks, to its hiking trails along and across streams; it’s officially my new favorite place in Austin. 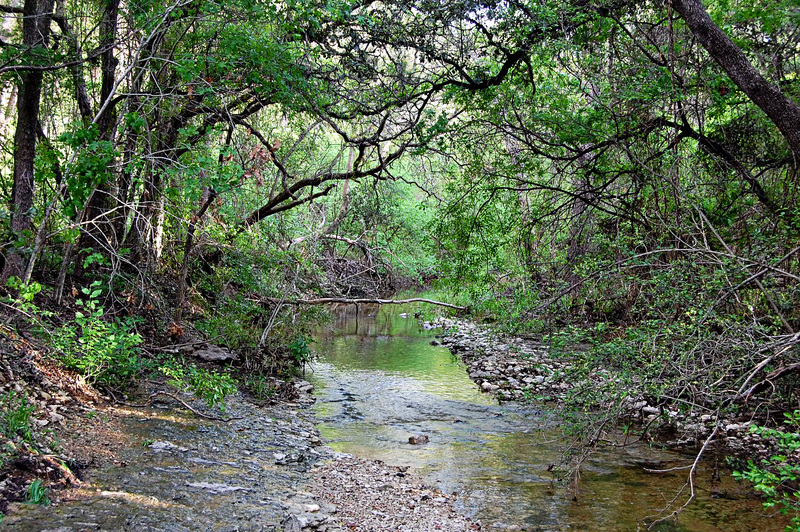 After the torrential downpour Austin experienced Monday evening and early Tuesday morning, Adam and I decided that later this week would be the perfect time to re-visit Mayfield and hike the trails. Camera in tow. Wow. I just thought the garden area of the park was gorgeous. But these trails? Some of the prettiest I’ve ever seen. It was a total escape and you truly felt like you weren’t in the middle of a large city. 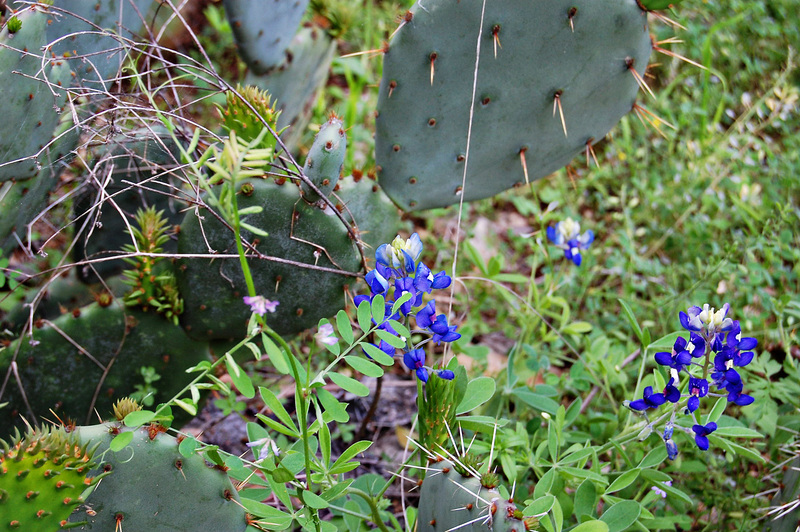 Texas Bluebonnets were in perfect harmony next to the rugged cacti that could be found throughout the park. 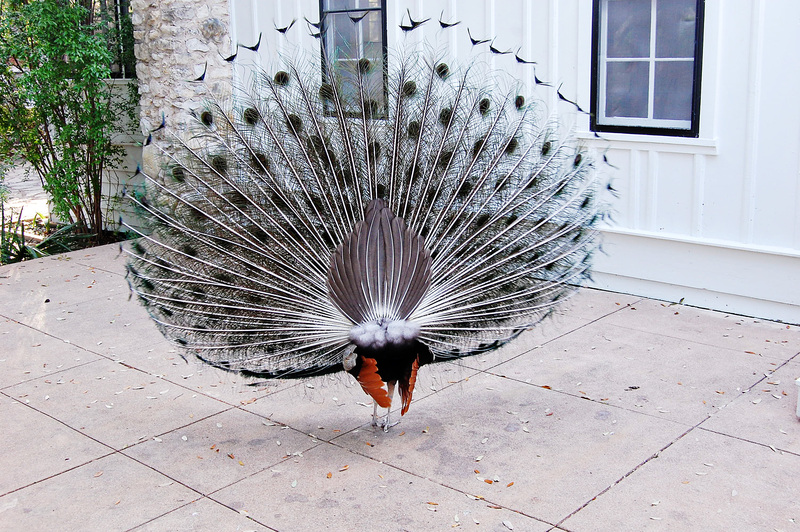 And, if you’re patient enough (or, like us, time it just right) you might just catch the peacock showing their full colors. 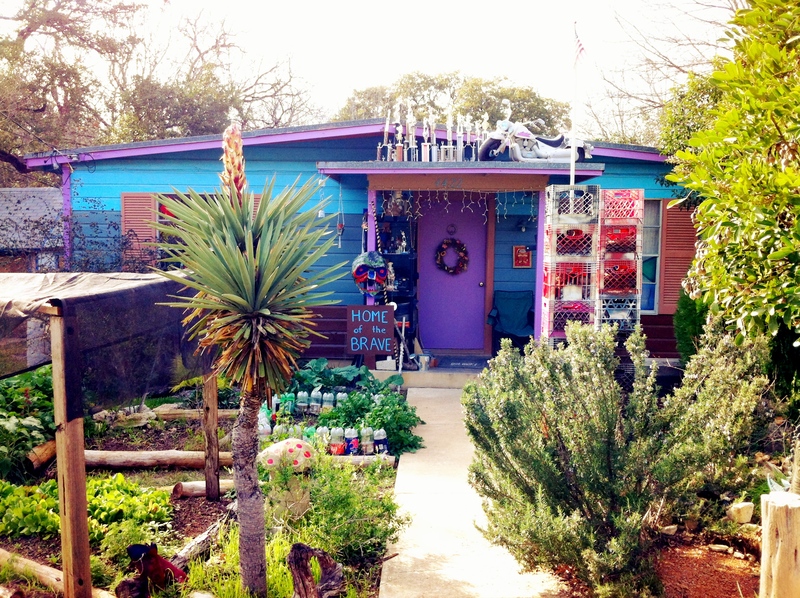 I’m certain that we will become regular visitors of this hidden Austin gem. 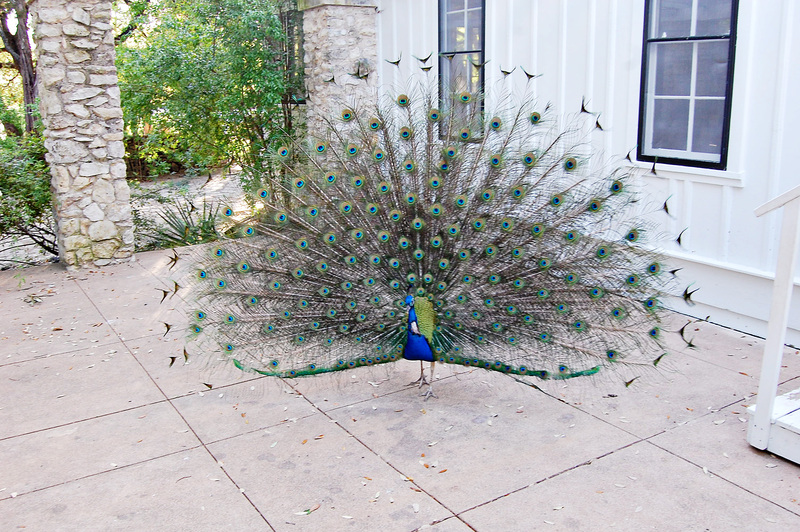 One of the nice things about living in Austin is the individuality that you find. Whether it be walking down the street, taking in Christmas lights or just exploring new neighborhoods while aimlessly driving. You really never know what to expect. 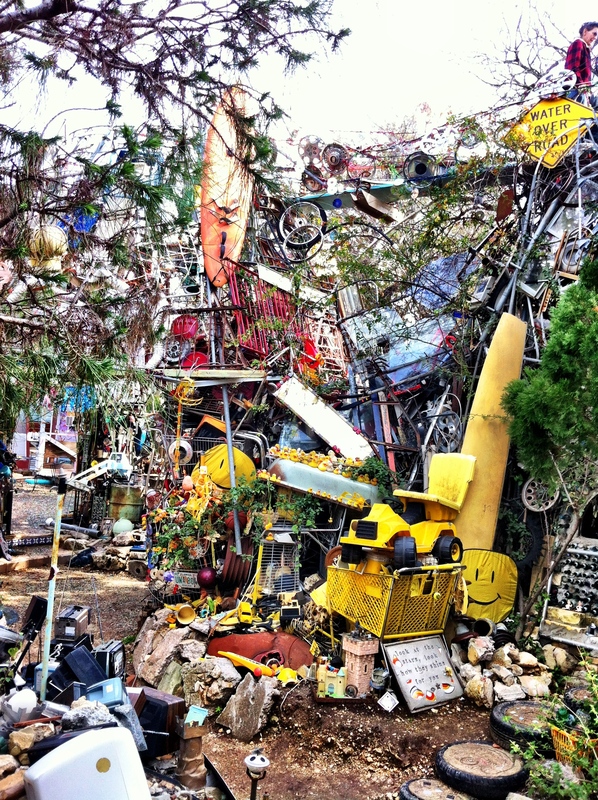 This weekend my friend Sarah visited us from Arkansas and we took the opportunity to visit The Cathedral of Junk. 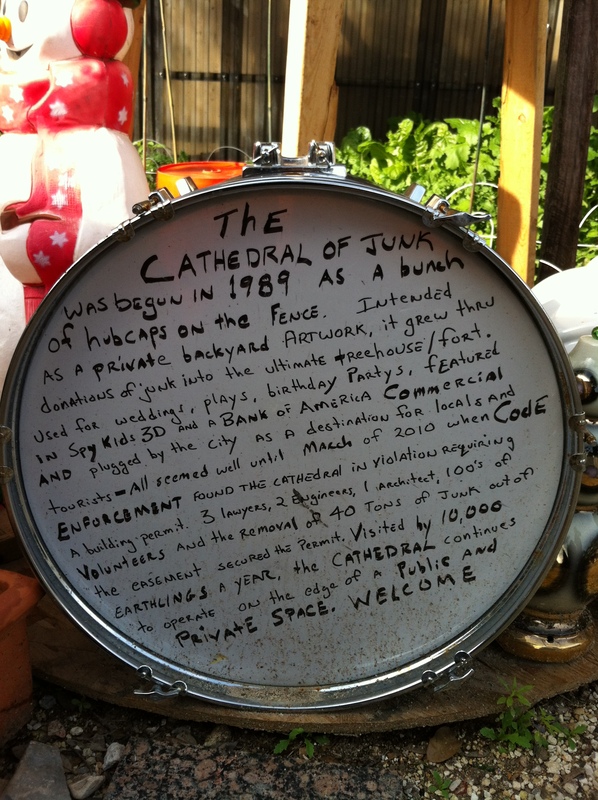 A guy started the project back 1988 in his backyard as a way to have fun and build his version of a clubhouse. 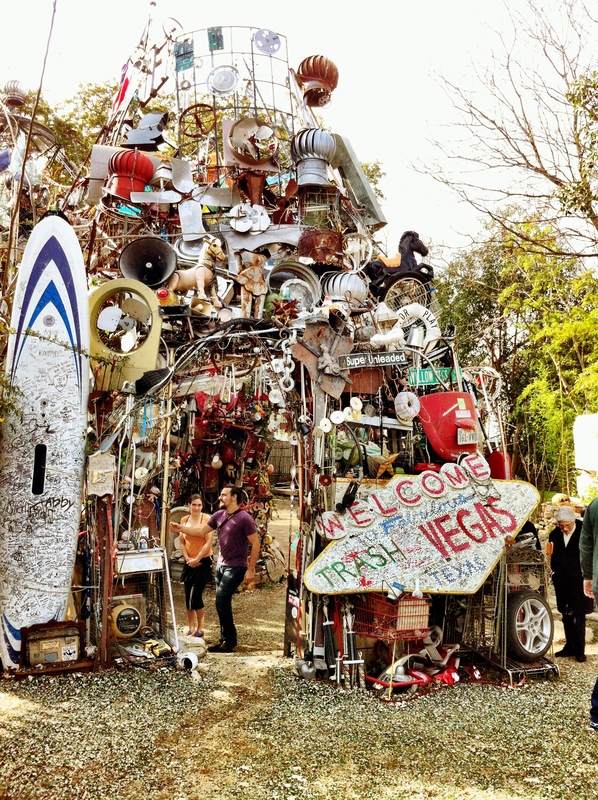 Since then, it’s become a 3 story tall structure made entirely of junkyard finds and it’s still in his backyard. 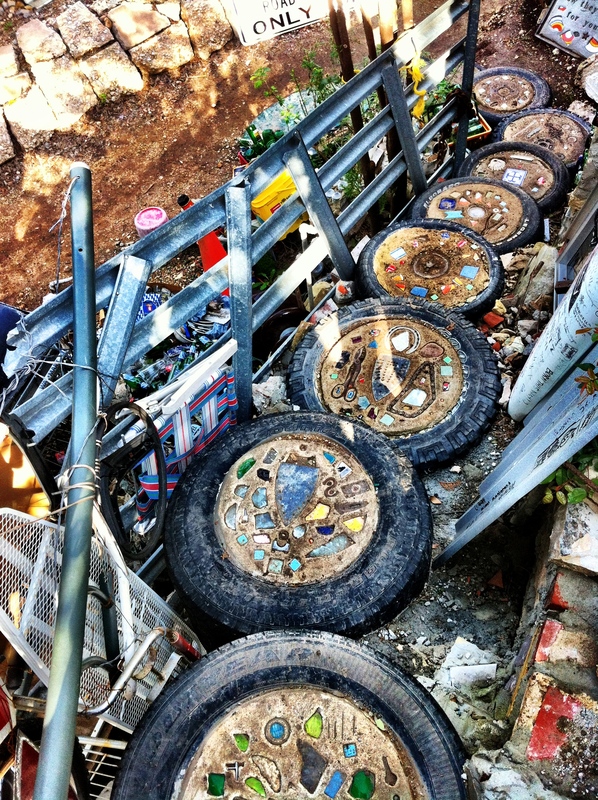 He estimates that it contains over 60 tons of junk. Yep, 60 TONS – most of which people brought to him. Full of lawnmower wheels, car bumpers, kitchen utensils, ladders, cables, bottles, circuit boards, bicycle parts, old AOL installation CD-ROMs, and anything else you could possibly imagine it’s quite impressive and beautiful – in that weirdly awesome Austin way. It’s a true Austin treasure and one that I’m certain we’ll be visiting again – especially when we have visitors. 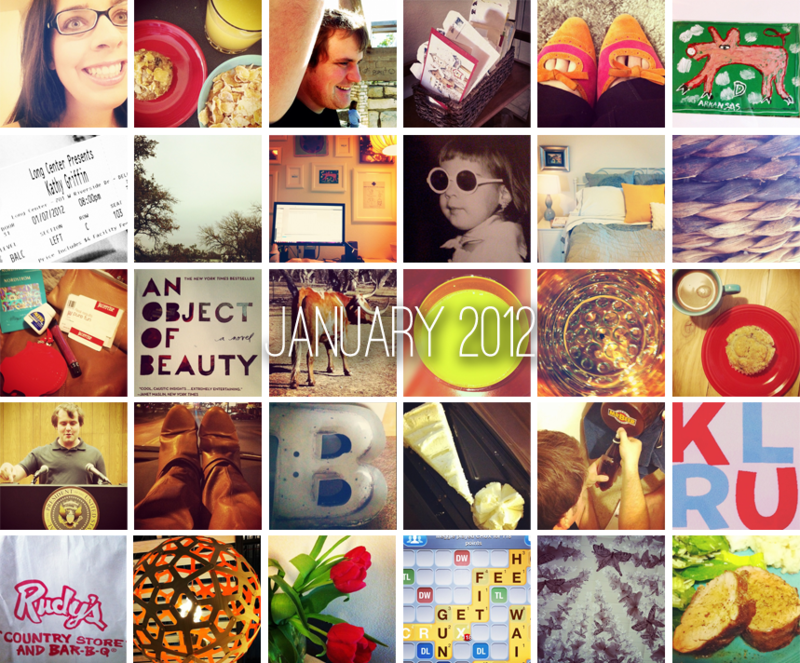 January was pretty awesome. Here’s just a few reasons why. The one thing I was adamant about throughout the planning process was a reception that reflected the type of couple Adam and I are. We like to goof off, relax, listen to good music and spend time with family and friends. That’s exactly the reception we had. Our reception was high-energy and laid-back and allowed us to be ourselves around our friends. and threw their hands up in the air like they just didn’t care. There were even a few sisterly dance moments. And then the DJ played “Single Ladies”. Remember the whole “Operation: No More Beyonce” thing and the fact that I’m slightly addicted to Jazzercise? I worked with my coordinator to loosely stage a flash mob, after I contacted my fellow Jazzercisers mere days before the wedding. Yep, our reception had a Jazzercise flash mob in the middle of the dance floor. It was so much fun dancing with my instructors and other Jazzer-buddies who drove down to celebrate with us! I seriously love those women! There’s even video evidence of our Jazzer-moment! Then I got sick…light-headed, stomach turning, overheated. Note to future brides: don’t go a full day on only apples and caramel sauce, get married, then expect to dance the night away in your wedding dress. Adam got me a bottled water, then got Heather, our coordinator, to come help. Yep. 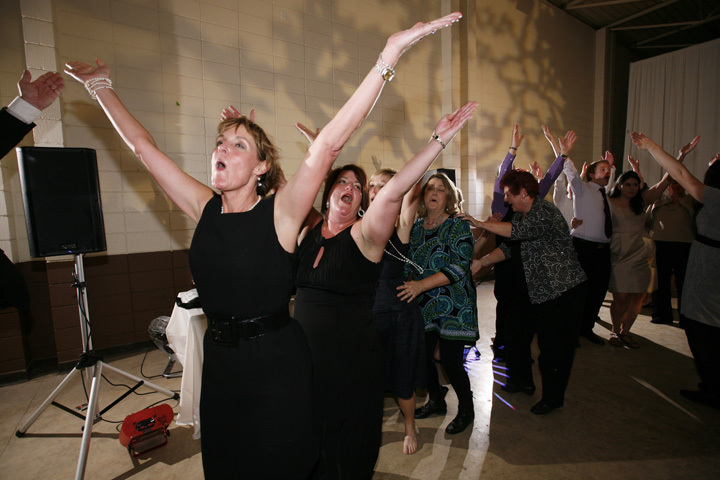 I missed doing the “YMCA” at my own wedding. But I was soon back out on the dance floor just in time for the “Time Warp”. My sudden weak state was nothing several bottles of water and a plate of food couldn’t fix. While I went back to the dance floor, Adam went to hang with his family. And by hang, I mean totally goof-off. 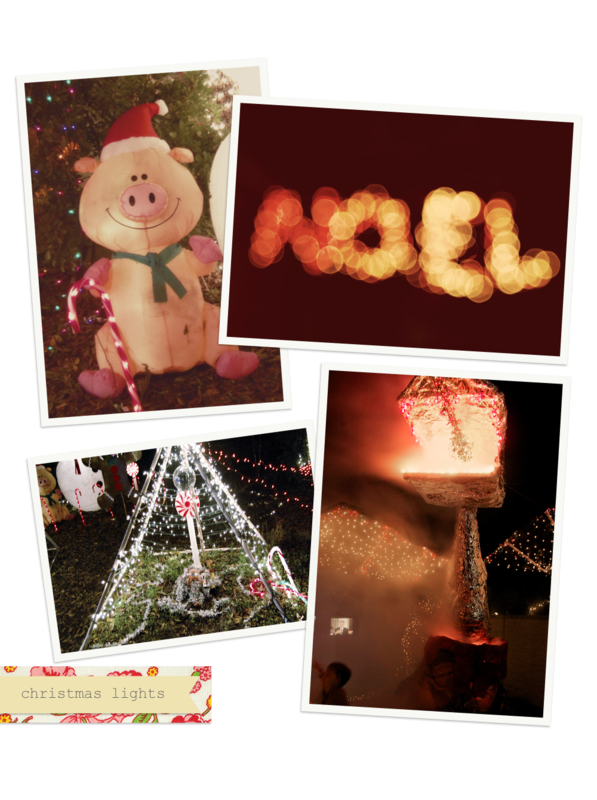 …before ending the fun-filled night with a sparkler getaway and a kiss to seal the deal. We were officially married and on our way to Napa Valley for our honeymoon! I’ll admit, we threw our amazing coordinator a huge curveball during the planning process when we told her the location of our reception. I wanted to create a warm, romantic, and vintage setting. In my hometown’s concrete and cinder block armory. She accepted the challenge without hesitation and transformed the space beyond my wildest expectations. Our reception began with a Wedding Party Entrance to The Beatles – All You Need is Love which took us right into our first dance as husband and wife to Adele’s cover of Make You Feel My Love. During our dance, we agreed that we felt very awkward dancing by ourselves in front of our family and friends. I also remember Adam goofing off during our dance, I think he was rapping along with Adele – which doesn’t really fit but, as always, made me laugh. 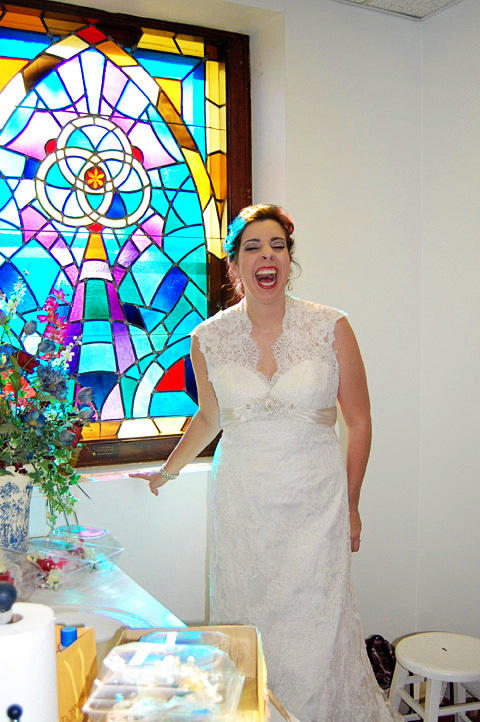 I love that our photographer captured that moment. Next up, was my father-daughter dance. My dad selected Louis Armstrong’s What a Wonderful World for our big dance – which was only a mere warm up for the rest of the night. After we showed off our fancy footwork on the dance floor it was time for Adam’s mother-son dance. Adam’s mom chose Lee Ann Womack’s I Hope You Dance for their special moment. 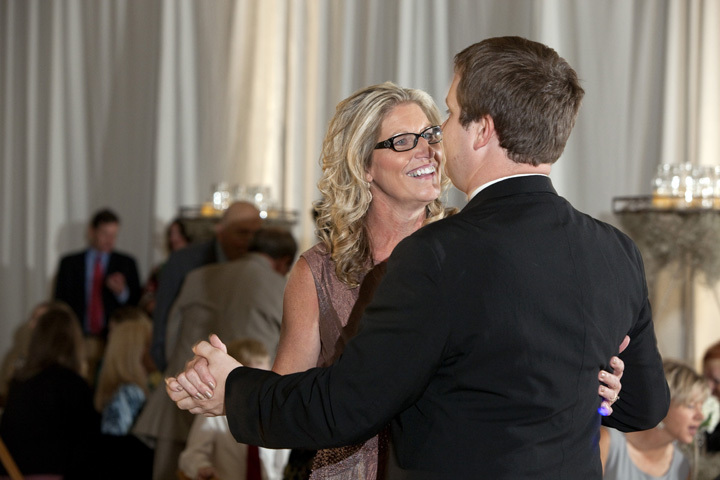 I absolutely love the looks of pure happiness on both our parents’ faces during these dances. Wonderfully captured by our photographer, yet again! Once the dances were done, our coordinator whisked us away to cut the cake. In fact, we were whisked so fast that our parents missed us cutting the cake. Thankfully, we have pictures that captured the excitement and yumminess! Our coordinator surprised us with some vintage forks I had been lusting over for months from Etsy. It was at the moment she presented the forks to us that my emotions from the day finally overcame me and I shed some very happy tears. Heather truly was the best! After the cake cutting, Adam gave a speech thanking our guests for coming and celebrating our special day with us. We also wanted to thank our guests personally and went from table to table in an attempt to do so. At the end of Adam’s speech, we led our Razorback loving guests in a Hog Call. It was only fitting since we intentionally picked our wedding day based on the Razorbacks’ football schedule – our wedding day was one of the only bye weekends of the season. Throughout the rest of evening we had a few scheduled “events” for special moments. First up? A sorority sing. My Alpha Delta Pi sisters are the best and I was so honored that they made the trip to the middle of South Arkansas to celebrate with us. Everyone has a specific part of weddings they love. For some it’s the ceremony or the way a groom looks as his bride is walking down the aisle. For others it’s the bride’s dress or the reception. For me, it is all about the little details. The things guests may or may not pick up on immediately, but that have importance to the couple and their families. Immediately after I got engaged, I started stalking wedding blogs and trying to determine a vision for our big day. I’m a Southern small town, Anthropologie loving girl and knew I wanted to bring in bits of this throughout the ceremony and reception. I emailed picture after picture to my mom of mason jars, lace, burlap, and wheat. I overwhelmed her and confused her. In my head I knew exactly how I wanted my wedding and reception to be, but telling it to someone else? Not that easy. 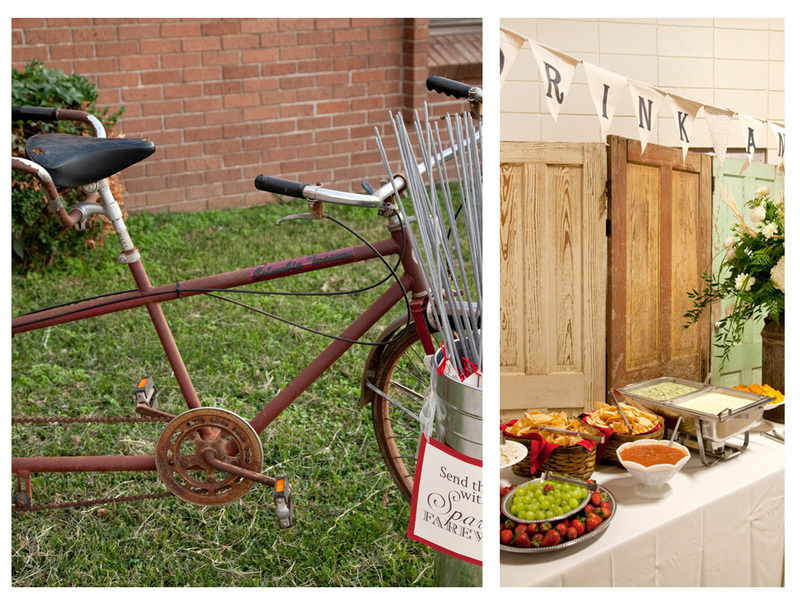 Eventually we got on the same page – understated elegance with a romantic rustic chic feel. I loved my bouquet and I loved that I was carrying a part of the strong women who were no longer here with me down the aisle. In memory of my grandmother Gran-Merle, we pinned one of her brooches to it, which served as my something blue, and wrapped the bouquet in a handkerchief which had a border tatted by my great-aunt Lila. In the months leading up to the ceremony, my mom worked tirelessly on various “mom-jects”. She sewed burlap table runners, found beautiful iron work medallions at a steal to use for mason jar candelabras, created perfect burlap bunting banners to hang at various places throughout the reception, sewed pillows and cushions for our hay bale lounge, hot glued lace to french pails, cleaned antique medicine bottles and glassware, made moss letters and burlap wreaths. And just one week before the wedding? She stayed up until 2:30 in the morning to bake 72 dozen of her famous dishpan cookies as favors for our guests. She was quite busy and I’ll never be able to adequately thank her for all of the love she poured into making our wedding day absolutely everything I imagined. Meanwhile, I was busy designing the program and other paper goods for the ceremony and reception using a few free graphics from the Wedding Chicks website which I manipulated to fit my overall vision. The family fun didn’t stop there, though. My dad and uncle built a screen out of old doors my parents salvaged from the 110+ year old victorian home I grew up in, all of which had been kept in our shed since they remodeled the home in the late 80s and early 90s. My dad also cleaned up his old tandem bicycle that had been stored out in the shed for as many years as the doors. Adam and his brother joined in the project fun as well, bringing wine barrels from the winery Adam worked in throughout high school and college which would serve as the “legs” for the groom’s table and my sister brought her large collection of wine corks to fill additional mason jars for the groom’s cake stand. I wanted our ceremony to take place in the sanctuary where I spent every Sunday of my childhood. The sanctuary where the kneeling pads my grandmother Ottie helped to needlepoint are placed around the altar rail. The sanctuary where I have so many wonderful, peaceful memories. I wanted to make a new memory in the place where so many of the memories that shaped me into the woman I am today were made. Well, we made many memories that day. From the chills I got as soon as the organist began playing the processional music for the bridesmaids – a song I had chosen in memory of Ottie, The Wedding Processional from The Sound of Music, to how I felt right before I walked down the aisle alongside my father. The memories were only beginning. As I walked down the aisle towards Adam, I faintly remember seeing friends and family out of the corners of my eye, ecstatic to be able to share this moment with them. I remember looking at Adam and seeing the look of sheer happiness across his face. I couldn’t stop smiling. After my dad presented me, the preachers began our traditional Methodist ceremony. Everything was moving along perfectly until the first prayer. That’s when my sister realized she forgot the ring. Thankfully, our coordinator, Heather, sensed that Madeline had forgotten the ring and was already halfway down a side aisle when it was time to place it on Adam’s finger. Unfortunately, it wasn’t fast enough to save Madeline from embarrassment. When the preacher asked for the rings, Madeline had to admit her mistake – which was the first moment Adam and I knew what had happened. Madeline hates to draw attention to herself – specifically embarrassing attention – so this moment couldn’t have been more perfect for me and I laughed heartily at the altar. Then I exchanged a forgiving smile and a high-five with her – yes, you read that right, we high-fived at the altar – before taking the ring and placing it on Adam’s finger. The moment we exchanged rings was surreal for me. This was actually happening. I was becoming Adam’s wife! I remember Adam proudly and loudly repeating each line of the vows after the preacher and I remember the look of complete commitment in his eyes. It warmed my heart and showed me a new side of him that I immediately loved. After a final prayer it was done. The ceremony was over and we were taking our first kiss as husband and wife. Our wedding party was the best! Just as I wrote of how wonderful my bridesmaids were, the same could be said for Adam’s groomsmen. They were attentive, hilarious, easy going and supportive all day long. Made up of siblings and close friends, there was no other group I’d have wanted standing in support of the commitment Adam and I were about to make to one another than this. Adam and I chose to have a “first look” prior to me walking down the aisle and I’m so glad we decided to do this! After exchanging our gifts and putting the final touches together before our wedding party pictures, our photographer whisked us off to the garden of the church between the education building and the sanctuary for our only chance to be alone on our wedding day. Adam stood with his back to me and between the coordinator and photographer we had a timed photo opportunity, followed by several moments of alone time to soak up all that was about to happen without interruption. It was perfect. Seeing him for the first time, EVER, in a tux was great in and of itself, but knowing that in just a couple of hours he would be my husband made seeing him at this moment even more special. I was overwhelmed with joy. I was full of love. I wanted to know if he was nervous. While home for Christmas, Adam and I received our gorgeous wedding album and disk of images from our photographer, Karen Segrave of KES Weddings. Ever since then I’ve been itching to share the story of our wedding day with you. From getting ready, to the “I Dos”, to the par-tay following the ceremony and everything in between, I’ve decided to break our day up into a series of blog posts. 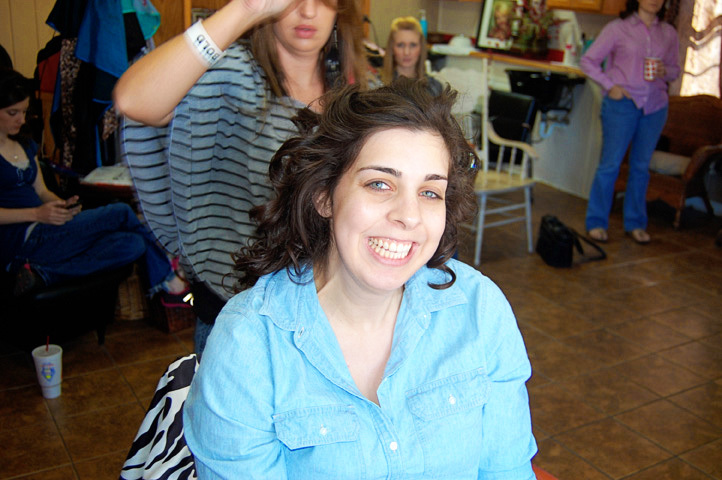 On the morning of our wedding, my bridesmaids and I gathered at a local salon in my small hometown to have our hair and makeup done. 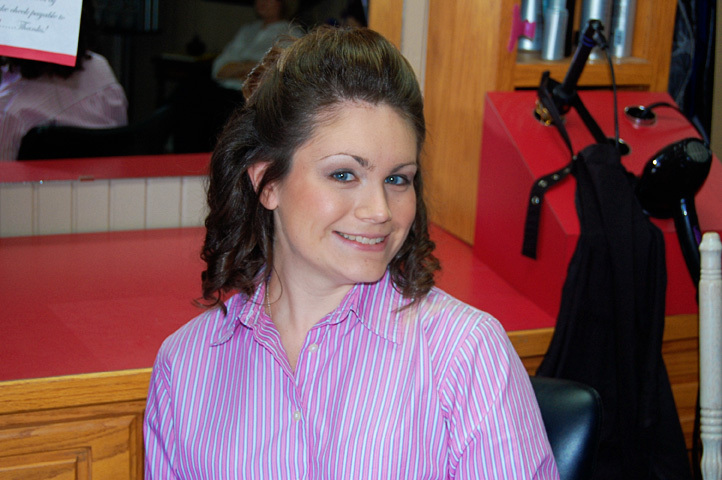 My sister served as photographer at the salon – which would explain why there are no pictures of my maid of honor getting ready. First up was Sydney, a hometown friend I’ve known for my entire life – and hers. Then my hilarious sorority sister, Sarah got her pouf on. Following Sarah was another sorority sister and sweet friend, Lauren – whose hair had never held a pouf until my wedding day. My bridesmaids were awesome that morning. We laughed, we played Tribond, we chatted about life and we enjoyed the Southern small town requisite lunch of Sonic. Well, I should say they enjoyed Sonic, I was given strict instructions by my wedding coordinator, Heather, not to eat anything greasy so I had apple slices and caramel sauce while the smell from everyone else’s greasy goodies filled the air. Leading up to my wedding I had no idea what I’d be like on my wedding day. Would I be nervous? Manic? Stressed? I actually ended up having a tremendous feeling of peace all morning and in the minutes leading up to the wedding. And, in addition to peace? Complete and utter happiness. I’m still shocked my cheeks weren’t sore the next day, because I’m pretty sure I had a smile all. day. long. Around mid afternoon, our photographer arrived at the church to begin capturing our day. 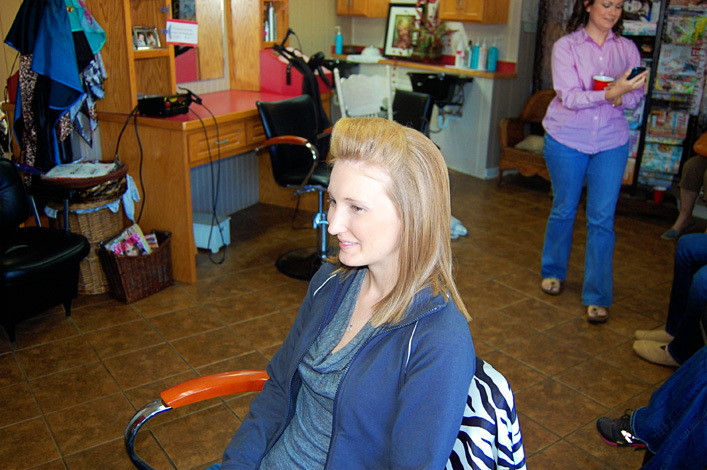 I had taken my dress, veil, and other belongings over to the church earlier that morning so that all I’d have to worry about once my hair and makeup were done was getting dressed at the church. After getting to the Bridal Suite at the church and getting everything in place it was time. Time to put on my dress. I was so excited for this moment. After putting it partly on in the bathroom, my mom helped to button me in. I still remember the rush of excitement that swept through me at this moment. After putting my dress on, I was able to relax for a bit. Adam and I had decided to exchange gifts first thing after we had gotten ready, so my sister took Adam his gift while Adam’s brother and best man, Sam, was in charge of delivering my gift.